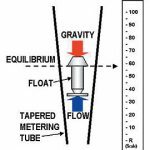 There are some advantages of rotameter which are given below. The cost of rotameter is low. It has good accuracy for low and medium flow rates. The pressure loss is nearly constant and small. 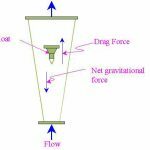 There are some disadvantages of rotameter which are given below. When opaque fluid is used, float may not be visible. It has not well in pulsating services. Glass tube types subjected to breakage. It must be installed in vertical position only. There are some important applications of rotameter which are given below. The rotameter is used in process industries. It is used for monitoring gas and water flow in plants or labs. It is used for monitoring filtration loading.